Justbe is hosting some exclusive events this month. Find the insights to your life in personalised sessions with Shqipe Malushi. She is visiting Bangalore for the first time ever. She would be conducting two types of sessions. Insights to your Life: A personalised Turkish Coffee Cup reading session that will help you have a closer look at your life and future. 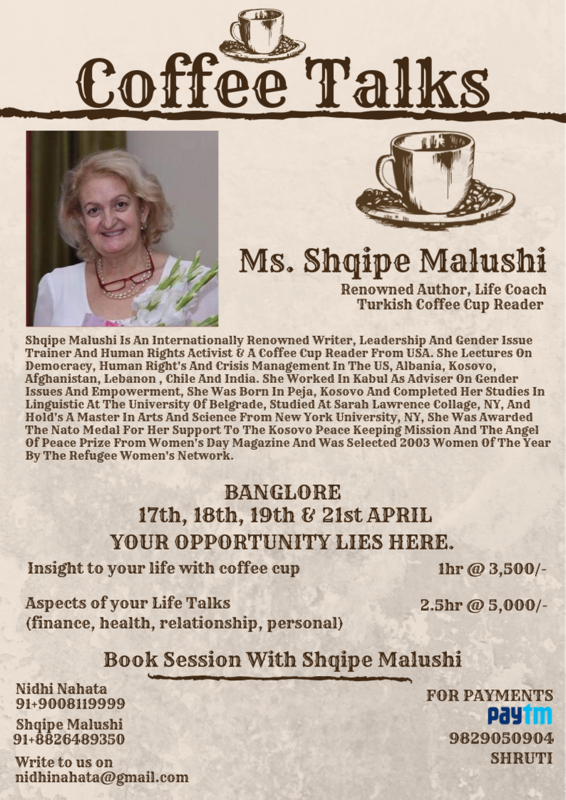 Shqipe Malushi is an internationally renowned writer, leadership and gender issue trainer, human rights activist and a coffee cup reader from the USA. She lectures on democracy, human rights and crisis management in the USA, Albania, Kosovo, Afghanistan, Lebanon, Chile and India. She was born in Pejo, Kosovo and has been living in the USA for the last 30 years. She worked in Kabul as an advisor on gender issues and empowerment. She completed her studies in linguistics at the University of Belgrade. She has also studied at Sarah Lawrence College and holds a masters degree in arts and science from New York University, NY. She was awarded the NATO medal for her support to the Kosovo Peace Keeping Mission and the Angel of Peace of Prize from Women’s Day magazine. She was selected for the 2003 Woman of the Year by the Refugee Women’s Network. The amounts is inclusive of taxes. For booking a slot or to know more about the venue, contact 88841 63061. For more information on the sessions, contact Shqipe on 88264 89350 or Nidhi on 90081 19999. For making payments using Paytm, please contact Shruti on 98290 50904.